The Olympics are wonderful, but it's hard to relate to most of the athletes. They've given their entire lives to a dream, while most people forget their New Year's resolutions on January 2. However, Chinese swimmer Fu Yuanhui has become a beacon of relatable excitement at the Rio Olympics. She genuinely appears to be having fun at all times and is willing to be completely authentic on camera, displaying a charming level of excitement about being on the world's biggest stage. She doesn't hold back, showing her excitement in all it's geeky glory. 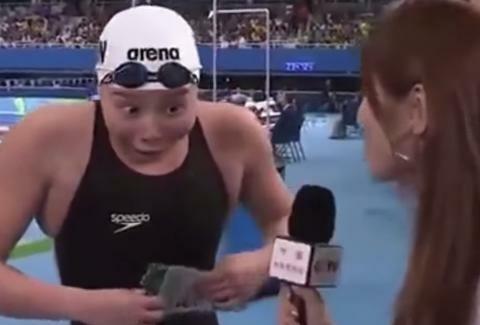 The first moment that captured the internet's attention was her interview following the women’s 100m backstroke semifinal on Monday. "I was so fast," she exclaimed. "I did not hold back. I already used all my mystic energy." If that wasn't enough, asked what her hopes for the final were she said, "None. I am already so pleased." At the final, she began giving a post-race interview with no idea that she had just won a bronze medal. She began to give her thoughts about doing well despite not winning a medal when the interviewer informed her she came in third. "Well, then I think that's not bad at all," she said. Now, she has a growing group of fans online who are drawing pictures of her, creating emojis in her likeness, and generally spreading her gleeful expressions. There aren't enough events at this year's Olympics for her to compete in. Maybe she can join Leslie Jones for the rest of the Games for a show that would easily provide the best entertainment in Rio.